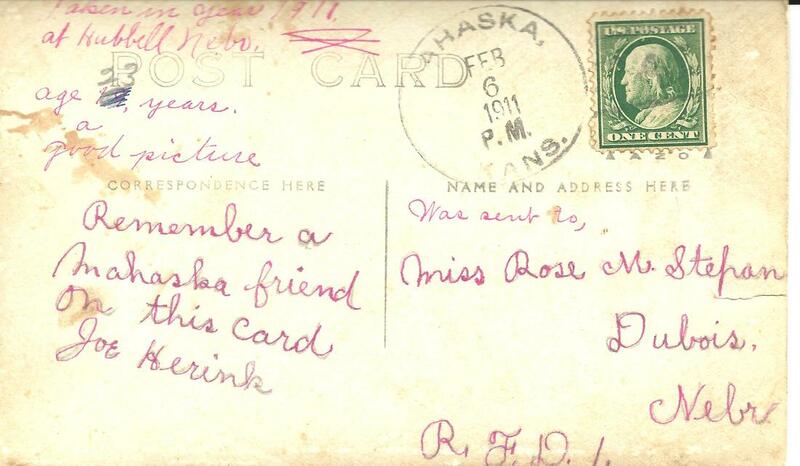 Photo 4642 - It is postmarked in nearby Muhaska, KS but on the back, but says it was taken in Hubbell, NE. 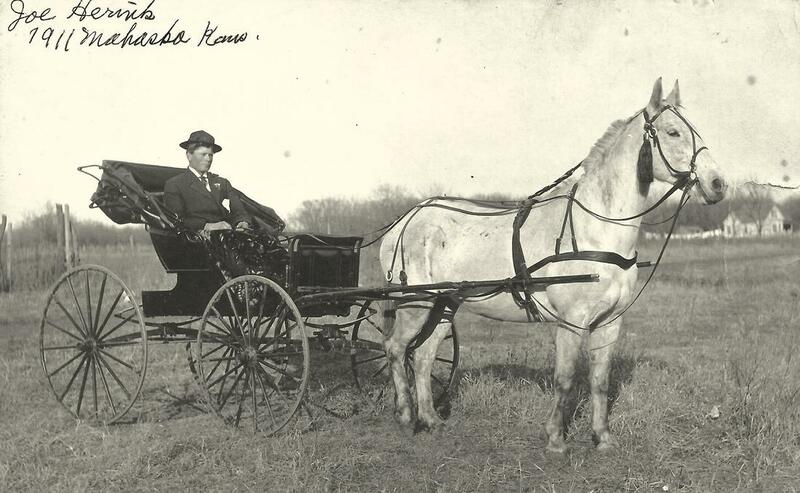 Both towns straddled the Kansas-Nebraska line and the farm was apparently just on the Nebraska side, which was Thayer County. 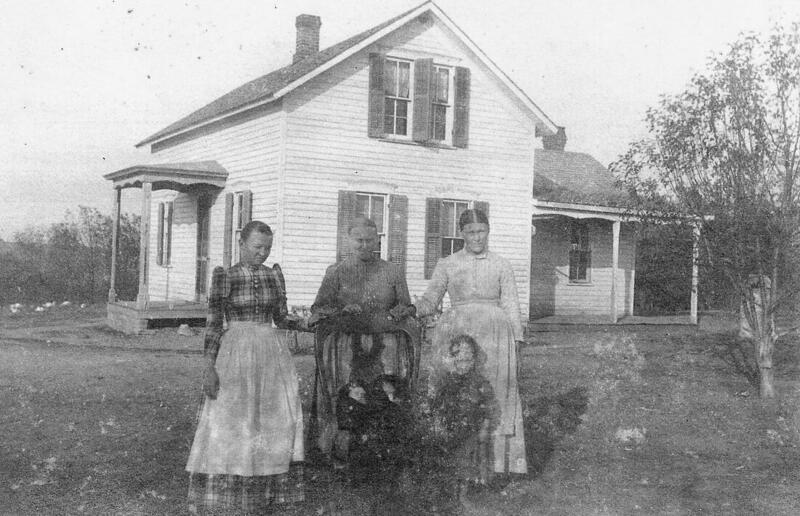 The house in the distance is not the farm where Joe would go with his new wife, who he would marry the year after this photograph was taken. Millie does not know what the Vencil or Joseph Herink homes looked like. Vencil was a wood craftsman in Plzen Bohemia . 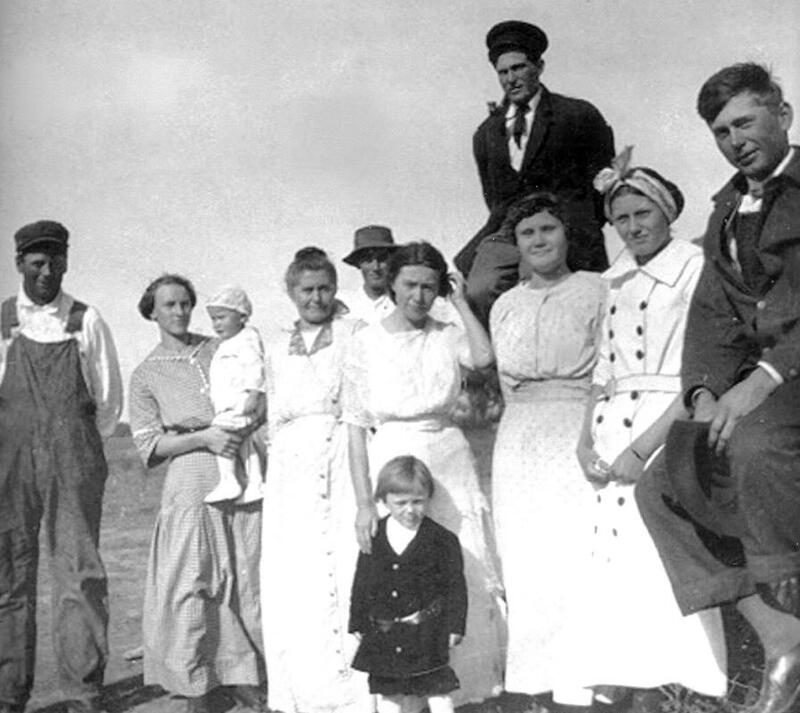 He built their home there and also a home on the land that they homesteaded here in Nebraska. City, Nebraska. 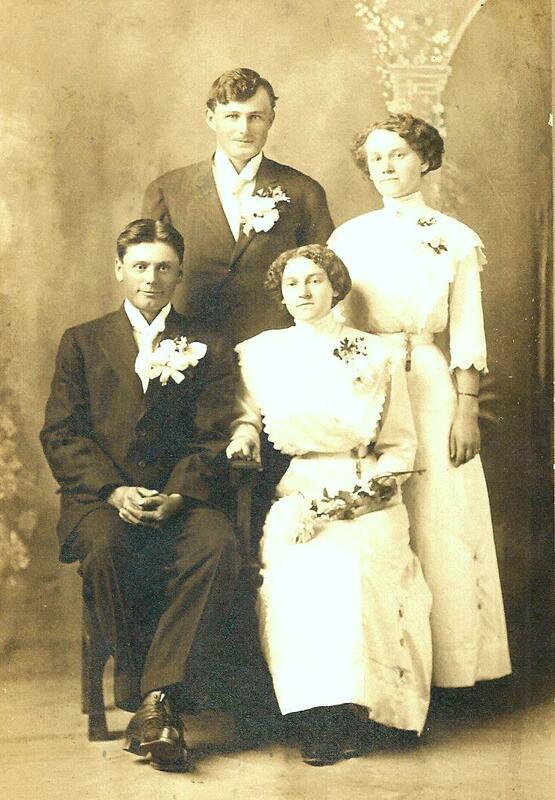 Attendants were Bessie Stepan, sister of the bride, and Amos Hubka, cousin of the groom. Amos drove them to the new Pawnee courthouse. The story goes that Rose had her handmade floral bouquet in a box in the car. Before they left, her father, thinking he was helping, took the box out so they would have more room. When they got to Pawnee City they realized they had no flowers for the photos so they had to go to a shop to purchase them. So the flowers in the photo were not hand made. 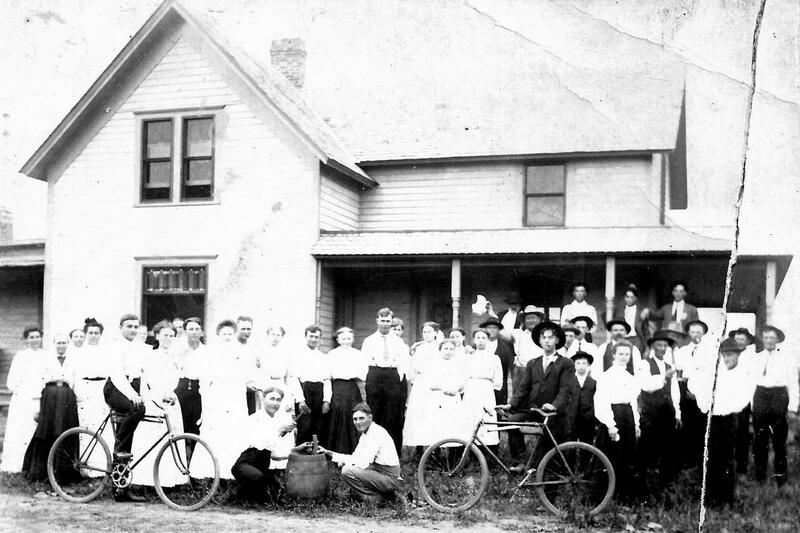 They had a wedding supper at the brides home near DuBois consisting of noodle soup, pies, kolaches, and many other goodies, all made by Rose's mother and sisters. After they ate, everything was cleared away and they danced to accordion music provided by Frank and Henry, her brothers. It was not mentioned in Rose's memoirs but I have a feeling they may have had some beer to drink. 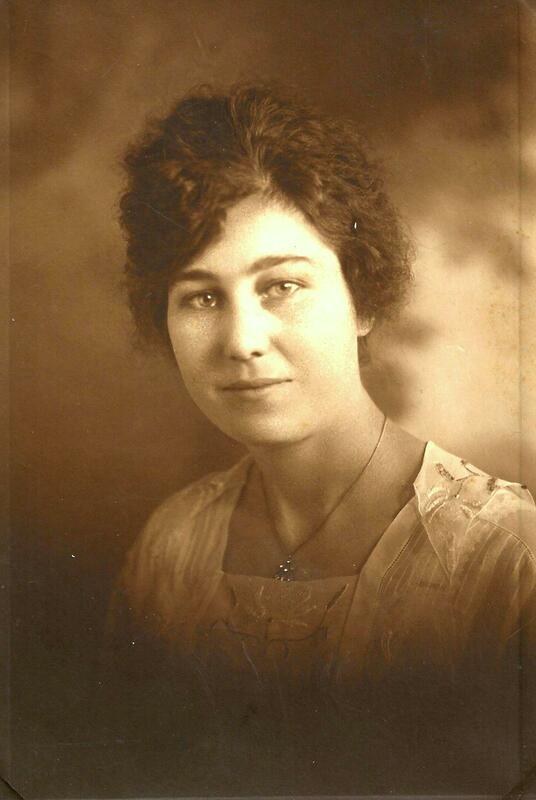 Where was the new home of Pawnee County girl Rose Stepan Herink? Some photos say Thayer County, Nebraska. Some say Muhaska, Kansas. Some say Hubbell and some say between Hubbell, Nebraska and Muhaska, Kansas. Hubbell is in Thayer County, Nebraska and is perched on the Kansas-Nebraska line. Muhaska in in Washington County, Kansas and is only a few miles away, a bit southeast of Hubbell. The farm must literally have been on the line. 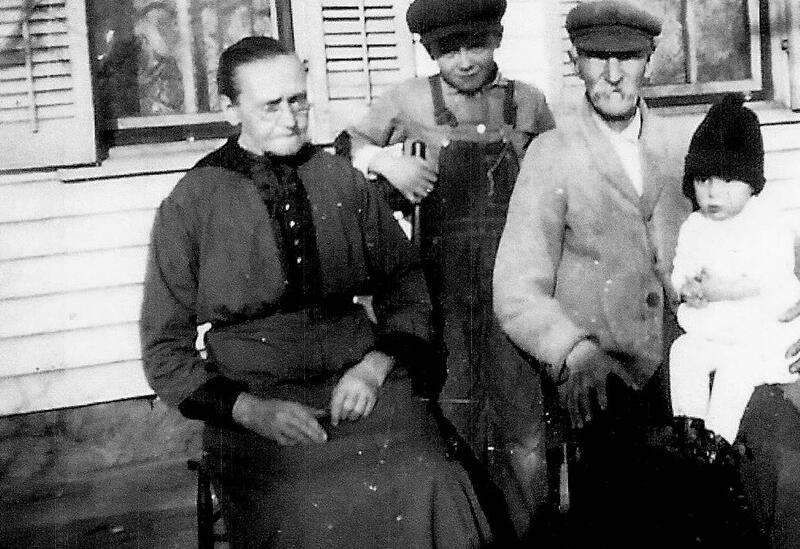 The 1910 and 1920 federal census records show Jose & Rose living in Rose Creek, Thayer County, Nebraska. 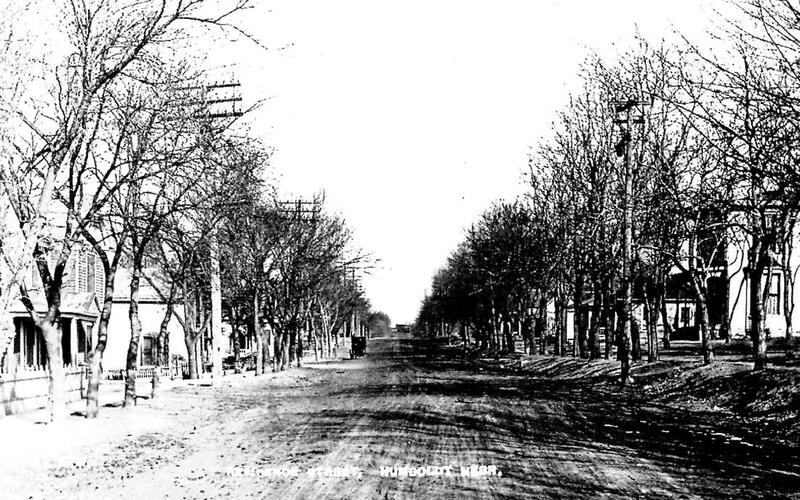 There was indeed a tiny town of Rose Creek in Thayer County, but it had disappeared long before that, when the railroad was built elsewhere. 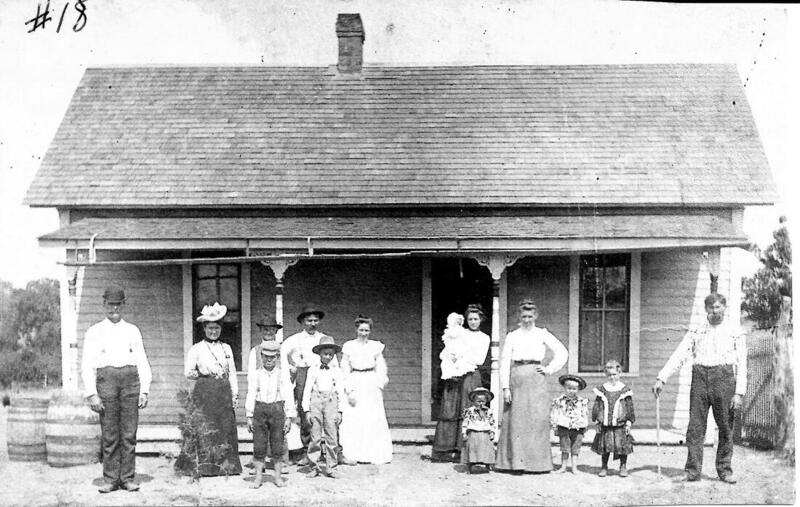 It was not at the Kansas-Nebraska border because the village of Rose Creek was said to have been north of the Republican Valley Railroad line built in 1880. HOWEVER, it turns out that there was a Rose Creek precinct in Thayer County. 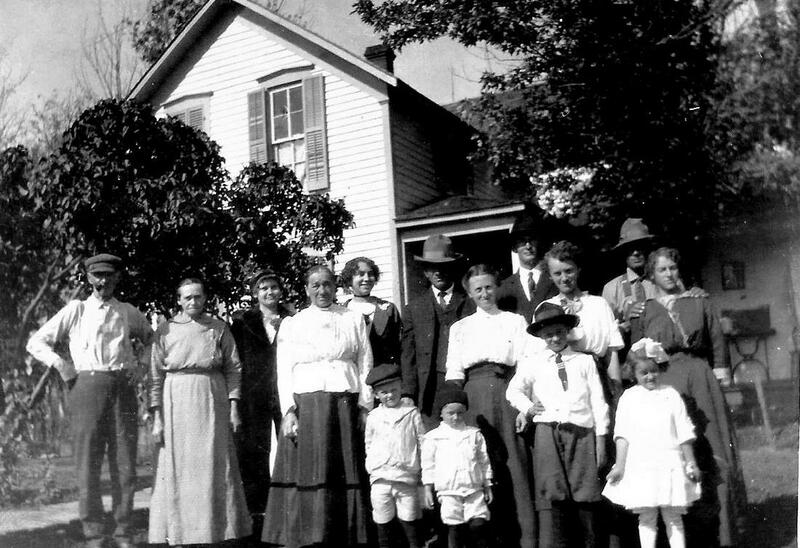 The operative word is "was" because in the days of the 1910 and 1920 census at least, the voting precincts in Thayer County did not have set boundaries. The boundaries changed according to the number of residents, and were subject to consolidation with other precincts. The precinct does not exist today. Hubbell is in Chester Precinct. Weirdly, Rose Creek Precinct in KANSAS is on the other side of the border from Chester Precinct in Thayer County, Nebraska, which is the currently the precinct in which Hubbell, NE is located. 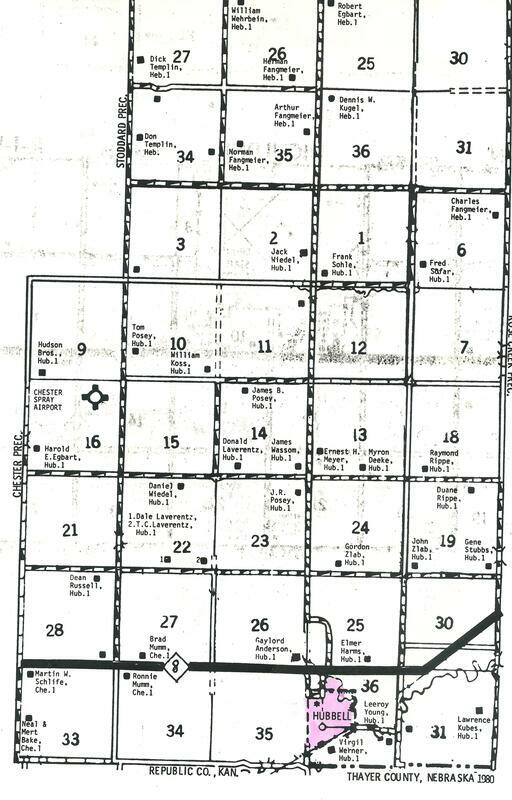 Bottom line is that we can tell that Joe & Rose lived in Thayer County and their farm was within the Rose Creek voting precinct in 1910 and 1920 but that Rose Creek voting precinct was apparently consolidated into another (perhaps Chester?) at some time after that. 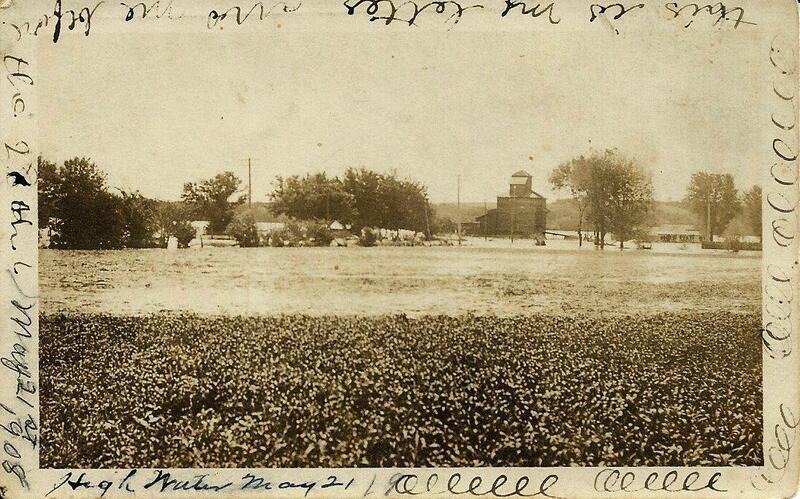 With all of that, who could be faulted for citing Muhaska as the site of some of these pictures? Photo 4614. Their first home. 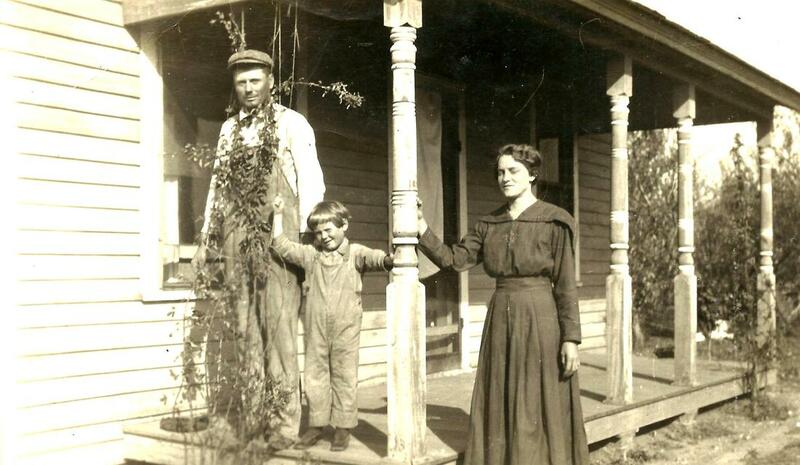 Millie says that Joe had been living here single, and brought his new wife here to make it their first home. 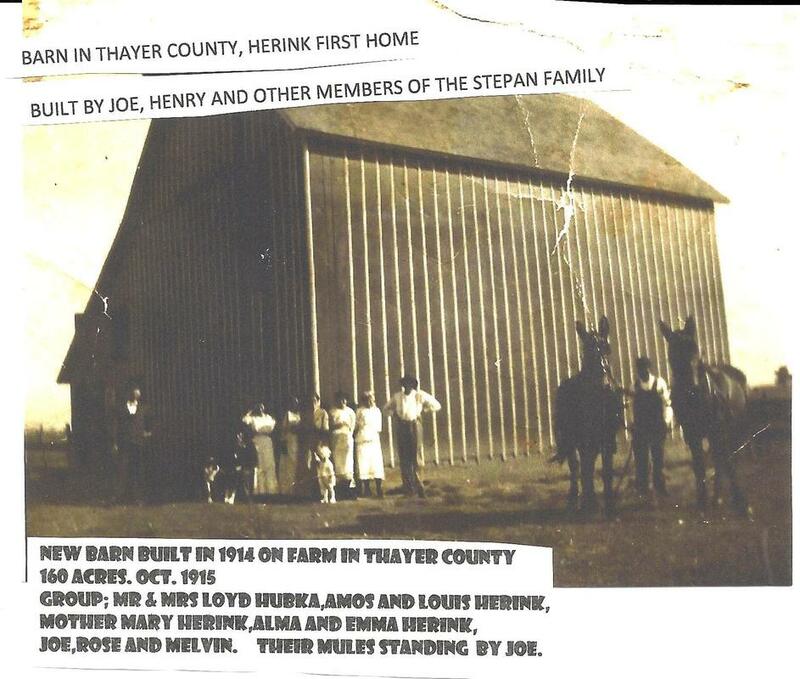 Millie says this photo was taken in Thayer county, the first home of Rose Stepan & Joe Herink and the men are building a new barn on the property. 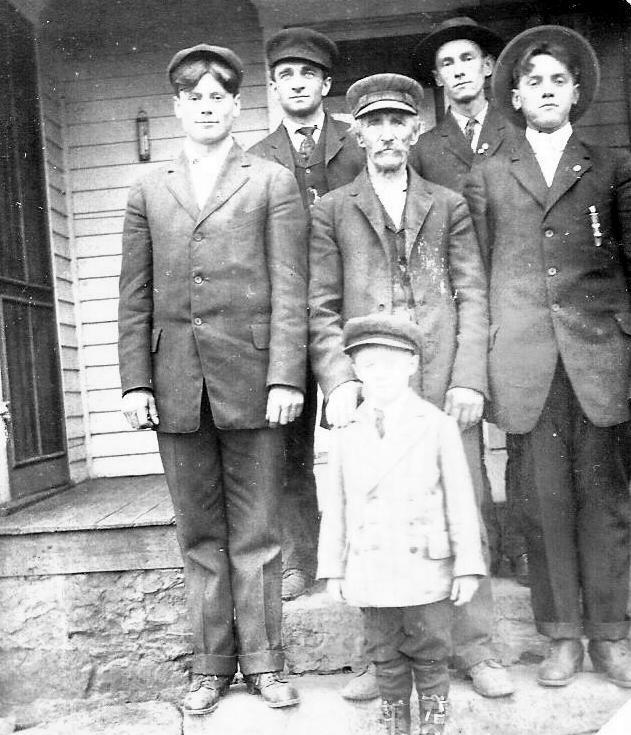 These are Rose's father Joe Stepan, and Rose's brothers Ralph & Henry. 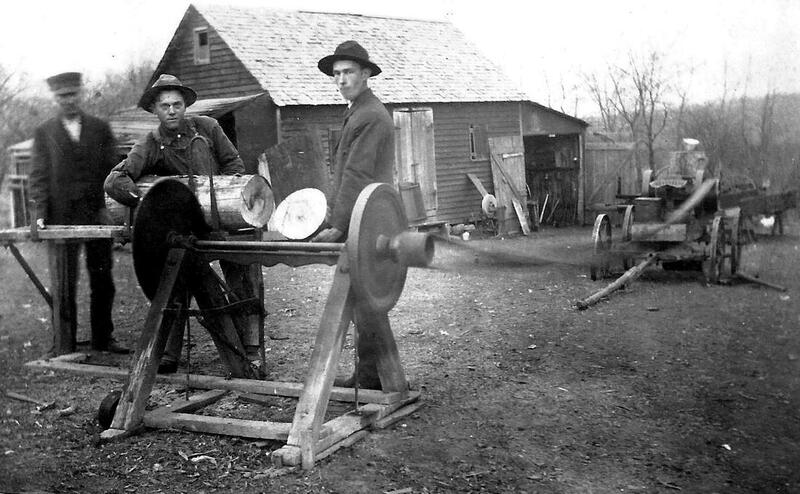 Henry, Ralph, & Joe Stepan cutting wood in 1913. Photo 6485. 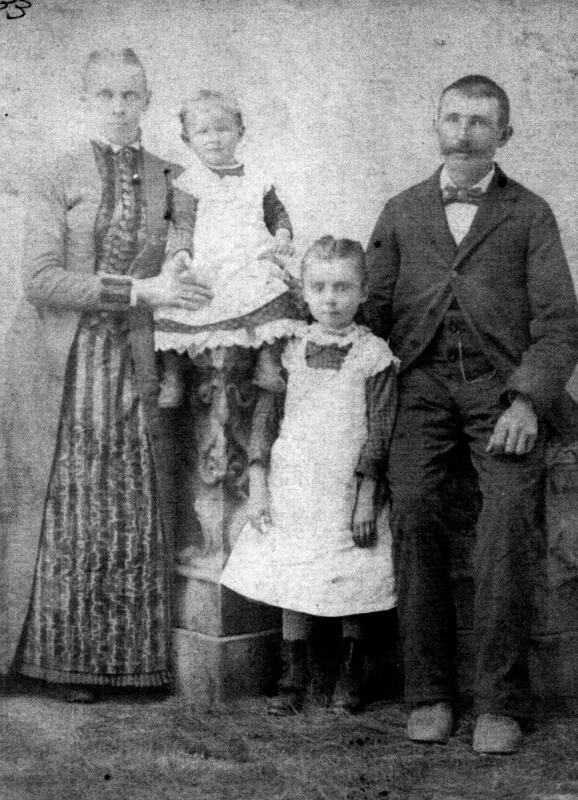 Of the group of four adults, the two on the right are Millie's parents, Rose & Joe Herink, with Rose holding Millie's brother Melvin. Photo 6478. Photo 4643 - Melvin Herink on his tricycle. 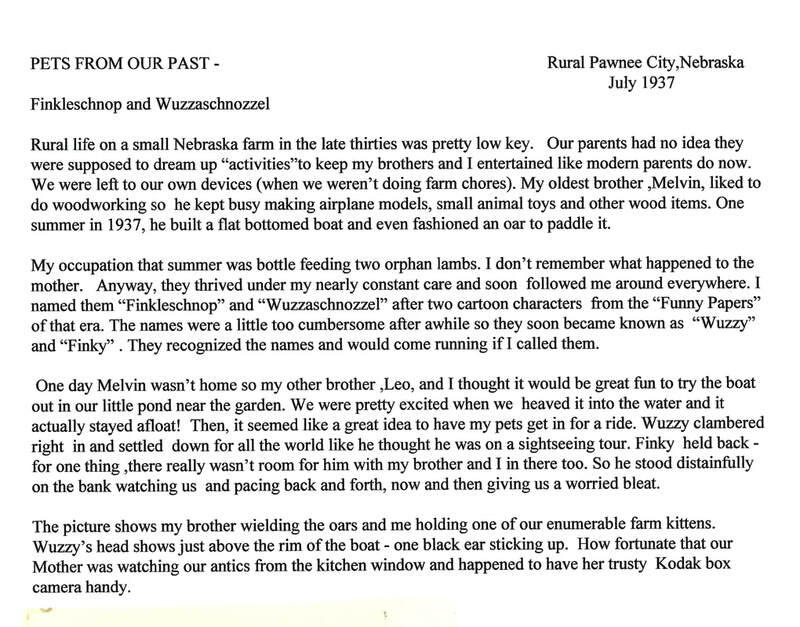 According to the photo, it was taken at the Hnizda farm near Table Rock. 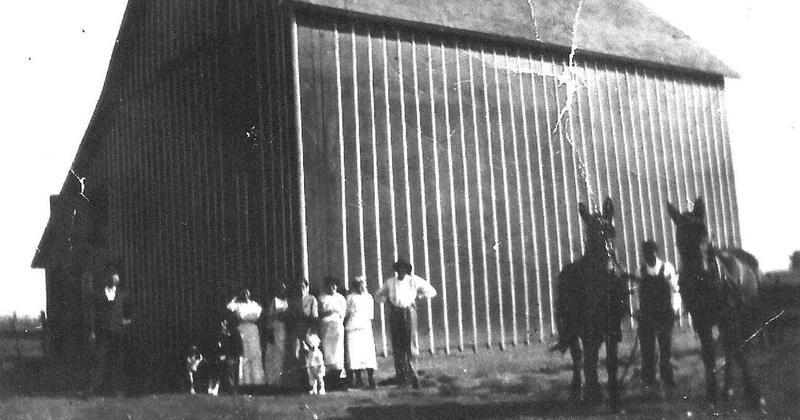 In 1927, a new machine shed & crib were built for Joe & Rose at their home in Thayer County, Nebraska. 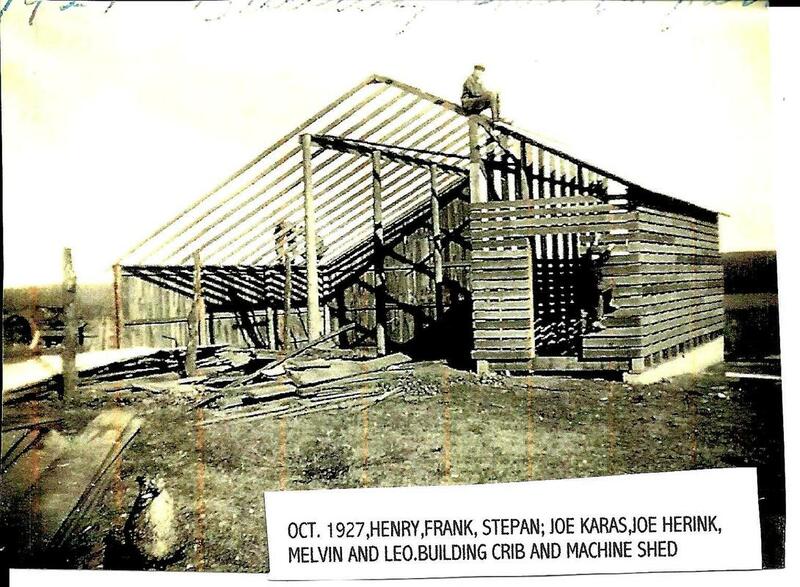 Working on the shed, according to the label, were Henry and Frank Stepan, Joe Karas, and Joe, Melvin, and Leo Herink -- all relatives. Photo 6487, Mildred's photo, unretouched & uncropped -- names &* date are here. When did they move to this farm? Millie was born in Pawnee City in 1929, so it was at some point before that. Photo 4618. 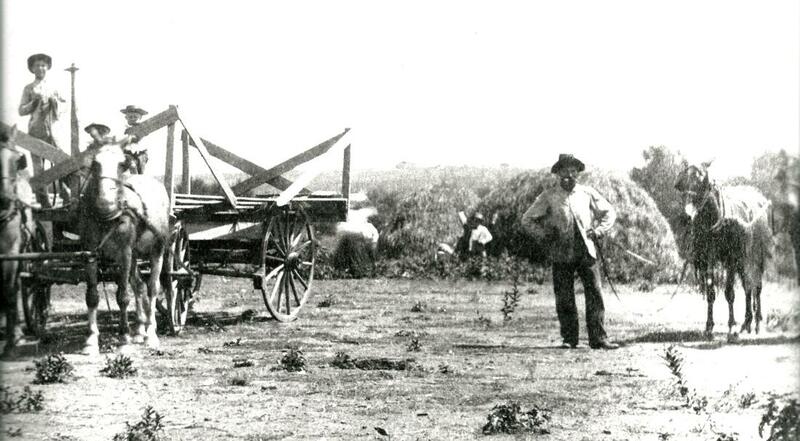 This farm was the second farm of Joe and Rose Herink, and was located two miles west and two miles north of Pawnee City. The farm was sold when Joe and Rose retired to a house in Pawnee. Later the house burned down and buildings also. 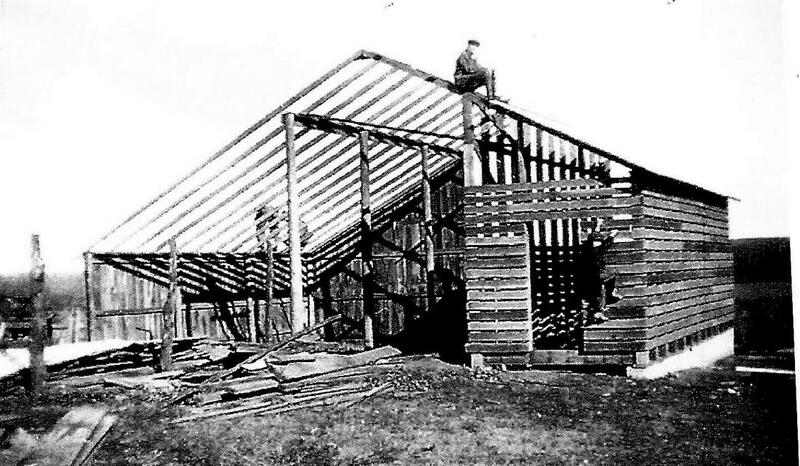 The first home was in Thayer county in the little house with the huge barn they built there. 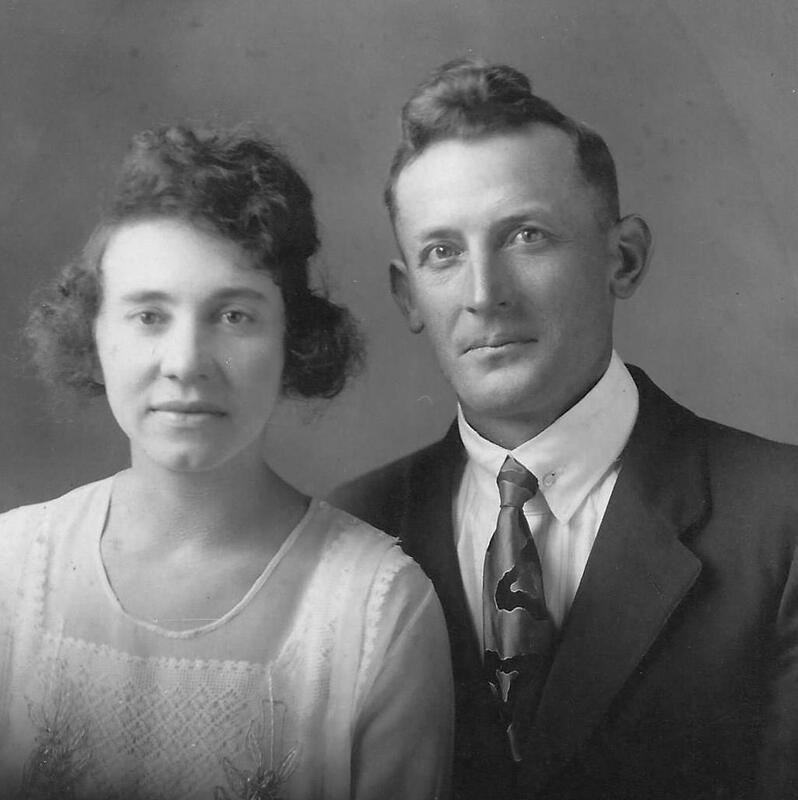 Photo 4617, Joe & Rose Stepan Herink farm's near Pawnee City. School year 1902-1903, prize for "best speling." From country school teacher Zella Andrews. Photo 4608b. 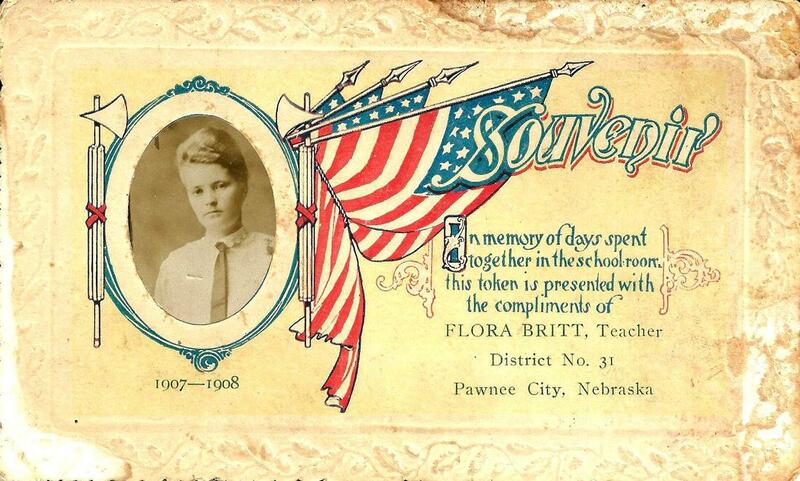 School year 1907-1908 memento from teacher Flora Britt at District 31 country school. Photo 4608a. 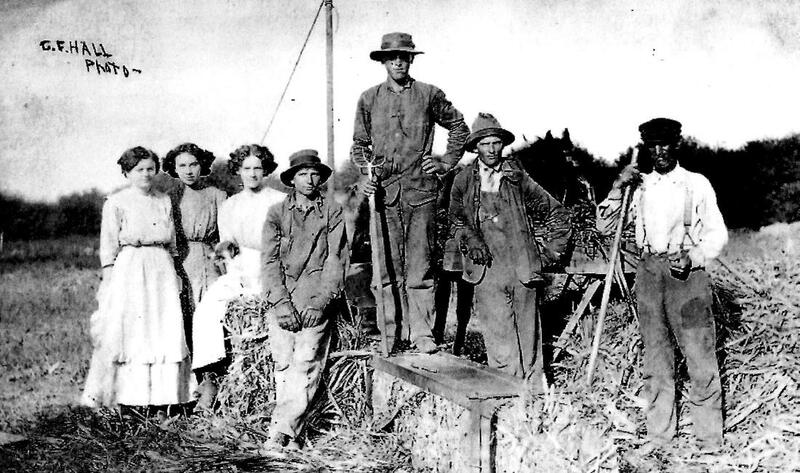 I have several old postcards of Ralph's threshing operation. Thanks to my Mother's being a writer and hoarder of old things, I have a lot of stuff. Also,Ralph's wife, Lillian was a photographer in those days. That was rather unusual...she even developed the photos herself. 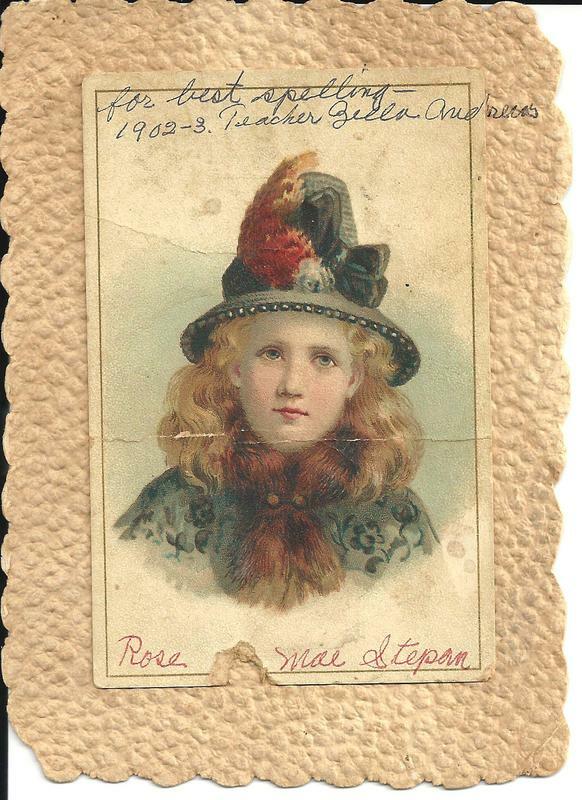 Mildred says that the photo is on a card and it says on the back, "Taken on the Hnizda place. Joe, Me, Mary and Ella. " 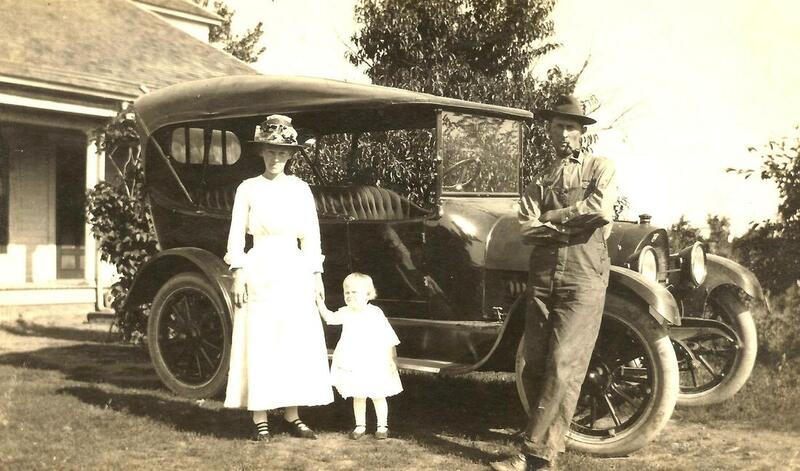 That would be Rose Stepan Herink, Joe Herink, with Mary Stepan Hunzeker on the wheel with the girl Ella -- last name unknown. Photo 6479.
photo 4649 -- with the grandmothers? 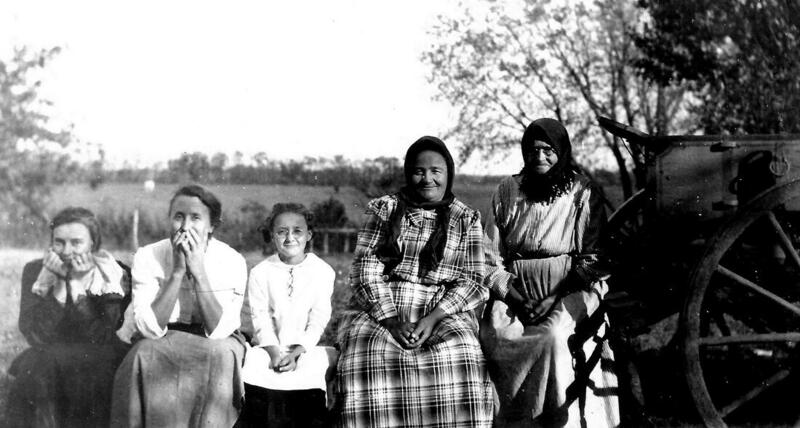 Millie says, “Left to right Mary Stepan, Tony Stepan Jasa, Millie Jasa Bryant, and two unknown ladies. 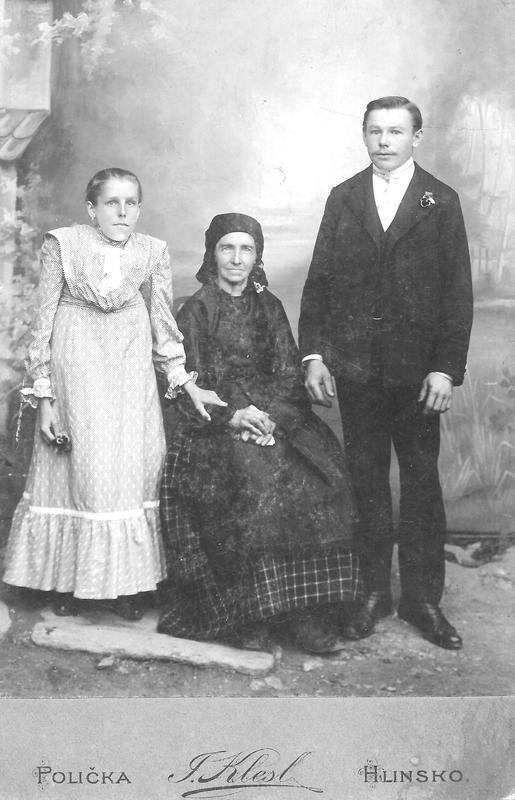 Rose & Bessie Stepan with Blanche Hubka, dated March 5, 1911. Photo 6491. 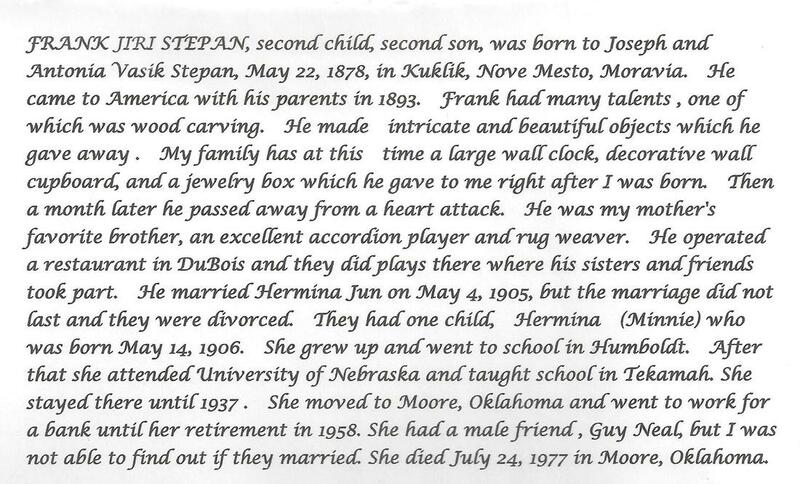 Henry Mary, & Rose Stepan & Frank Slama. Photo 6489. Joe Stepan's original house. It was on a 120-acre farm near Dubois. Photo 6682. 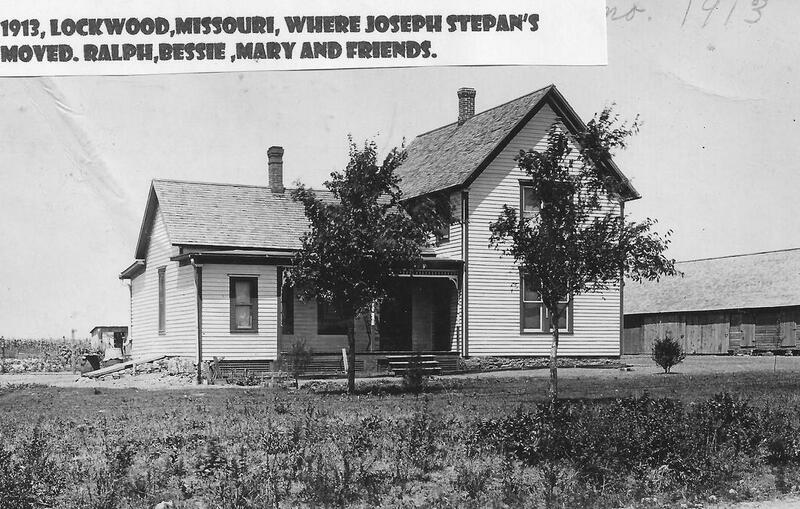 Joe Stepan moved to Lockwood, Missouri in about 1913. 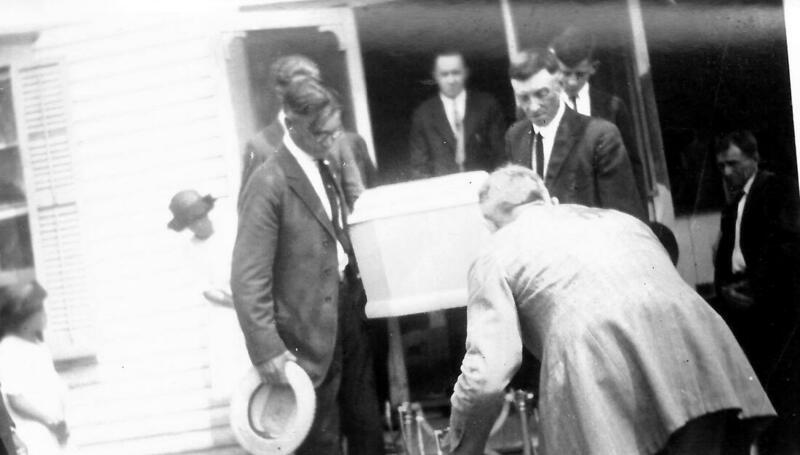 Lockwood is in southwest Missouri; at the last census, the population was 936. 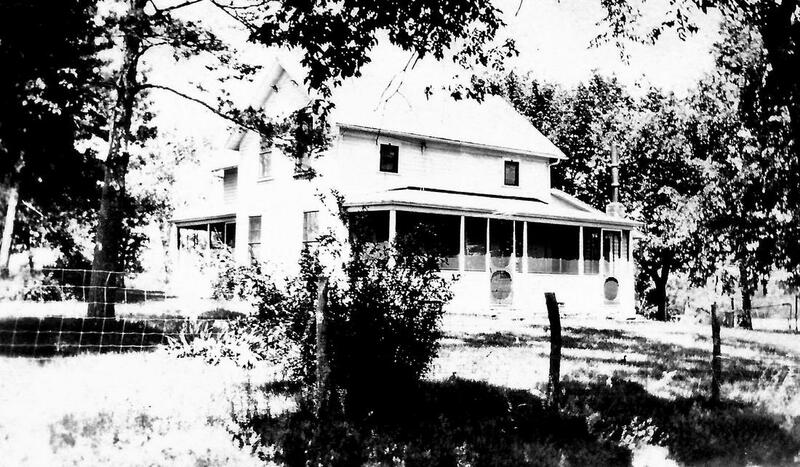 The Stepan home in Lockwood, Missouri in 1913. Photo 4605. 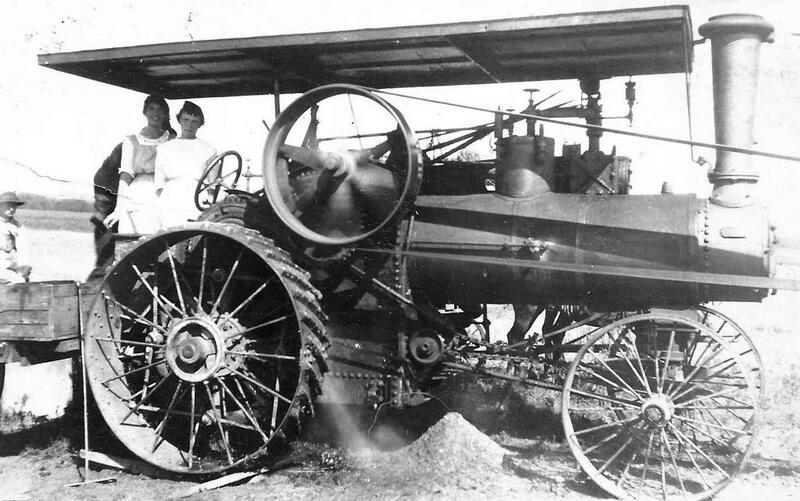 Lockwood, Missouri in 1913. Ralph Stepan on bale, Joseph Stepan on the right. 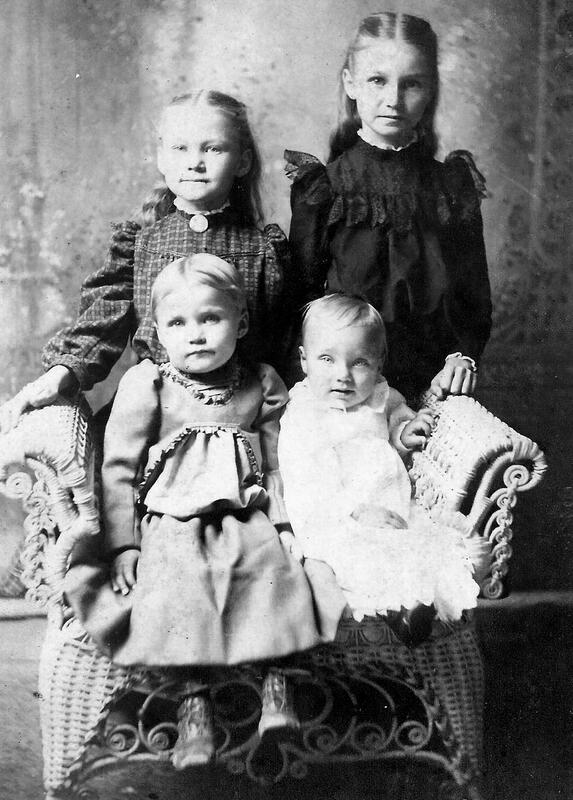 Marie and Bessie are on the left. The others are neighbors. Photo 4625. 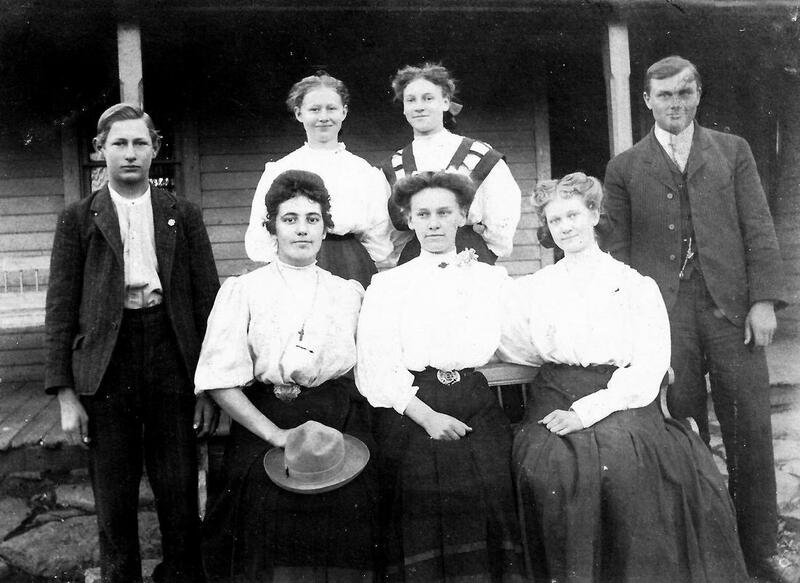 Back row: Ralph Stepan and Frank Kadlec (neighbor); seated: Lois Smith and Marie Kadlec (neighbors), Bessie Stepan Karas, and Marie Stepan Hunzeker. Photo 4616, taken in Lockwood, Missouri. On closer look, Bessie Stepan Karas and Marie Stepan Hunzeker are wearing flags on their bosoms, and Ralph Stepan has a nice head of hair! 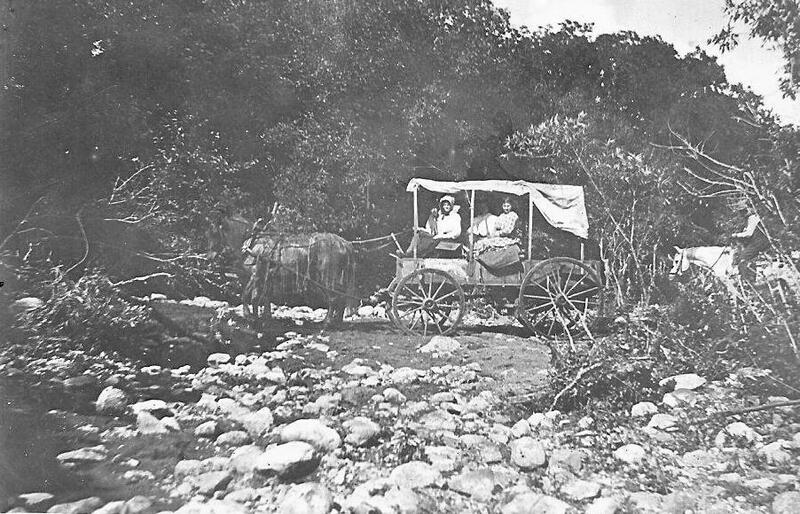 Bessie, Mary and Tony lived in the Table Rock vicinity all their married lives. 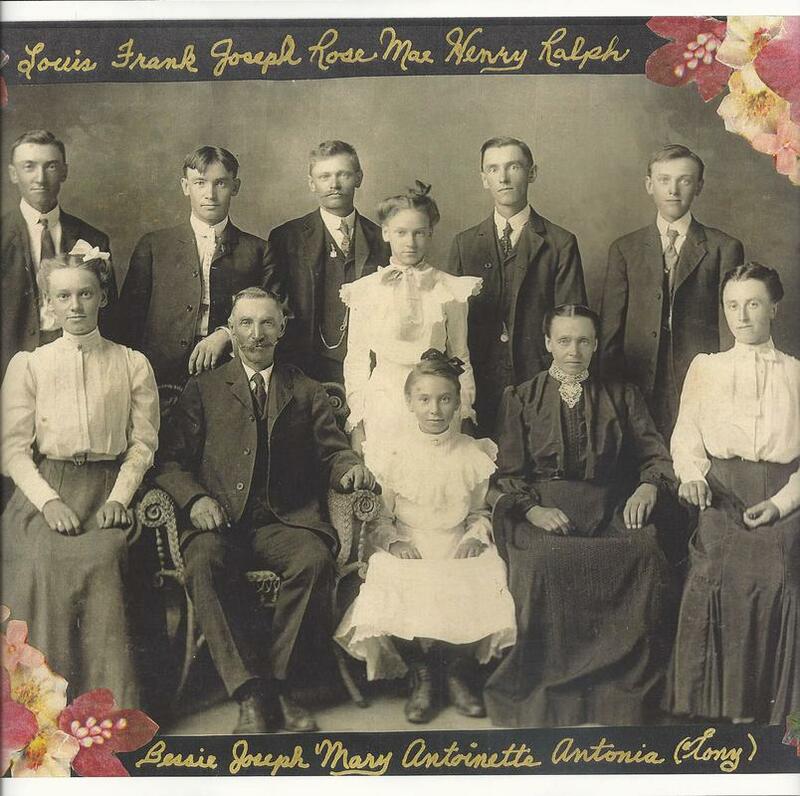 Some of the younger children of Joe & Antonie: Frank , Bessie, Rose Mae, Mary, and Henry Stepan. 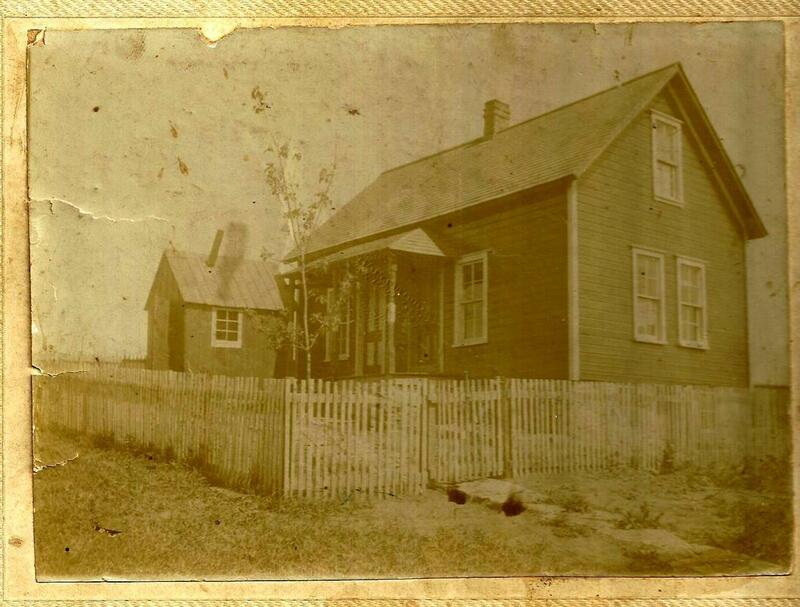 It says on this card that this house was known as the Wenzbauer farm and that they bought it and moved there in 1906 (but does not give the date of the photo as 1906, although it could be). It says thgat the farm was three and one half miles from DuBois, so this is where Rose lived and went to school. Later, probably after Rose left home, the family lived at the Hndiza place. Millie says, "They really moved around a lot!" Pete Jasa from the family photo taken in 1913, above. He lived a long life. 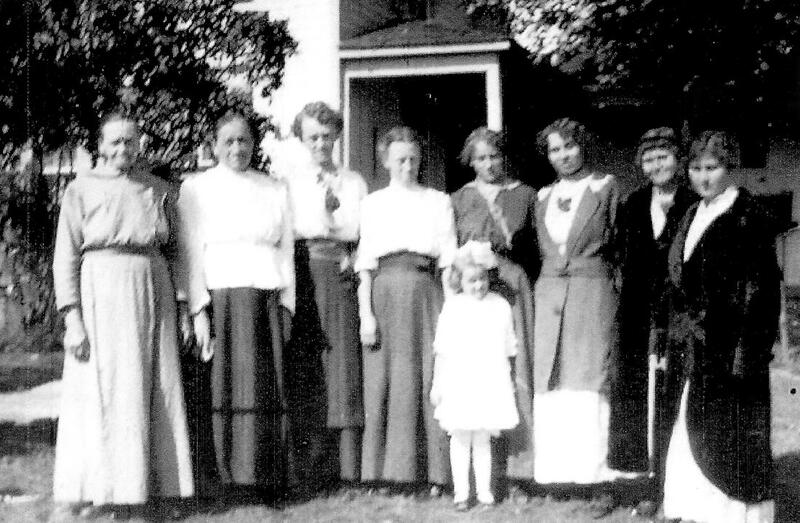 Photo 4630: Left to right; Mother Stepan; Mother Jasa, Bessie Stepan Karas, Tony Stepan Jasa, Mary Stepan Hunzeker, Emma Herink (sister of Joe Herink), Lillian Novotny Stepan (wife of Ralph Stepan). Lillian took the photo. 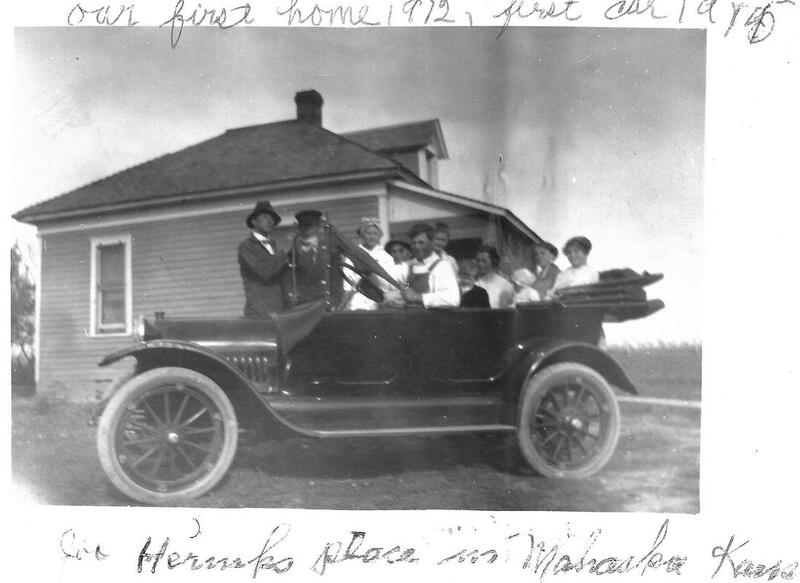 Oct. 1915; taken at Joseph Stepan's home. 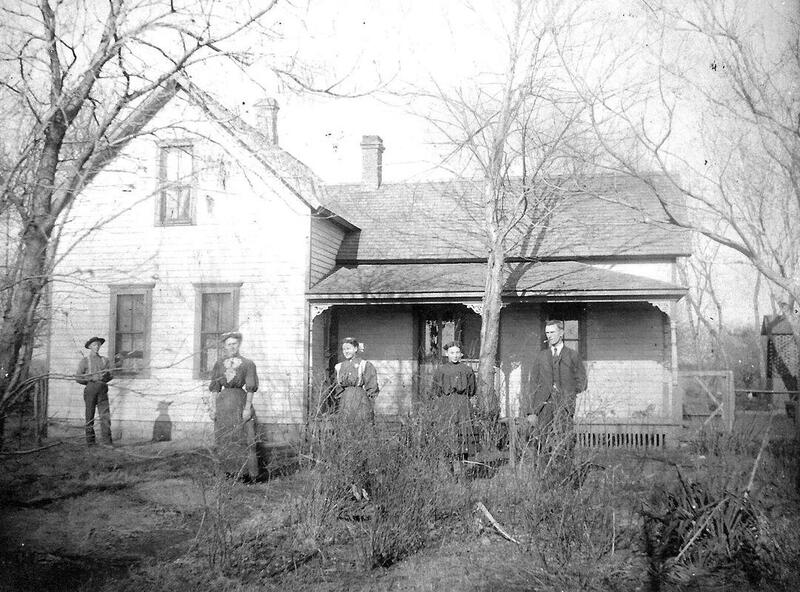 A November 1908 house party. Ed Hubka and John Stepanek, far left and right. 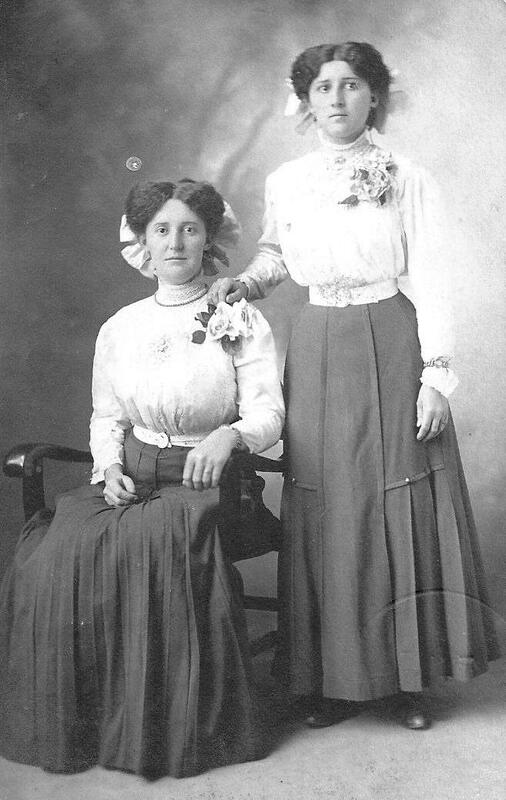 Standing: Blanche Hubka & Rose Stepan Herink. Seated: Bessie Wenzbauer, Bessie Stepan, & Bessie Rakosnik. Photo 4622. 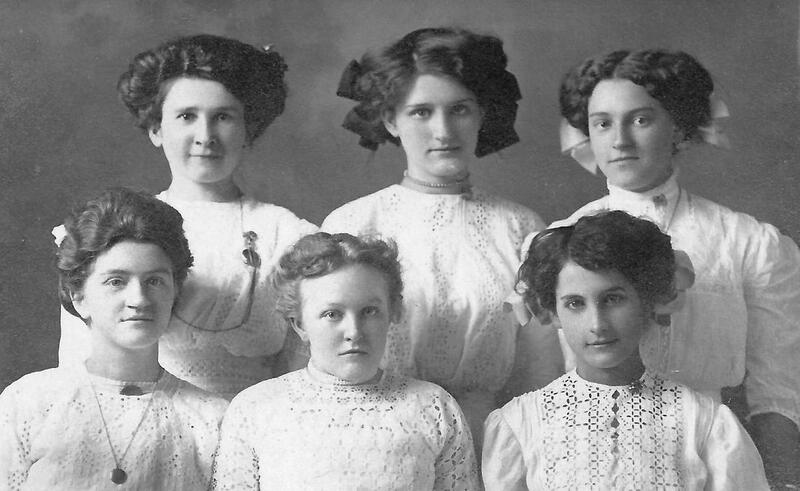 Fun in the snow: Dec. 29, 1909, In the snow: Back row: Anna Stepan, Bessie Stepan Karas, Bessie Rakosnik, & Mary Stepan Hunzeker. 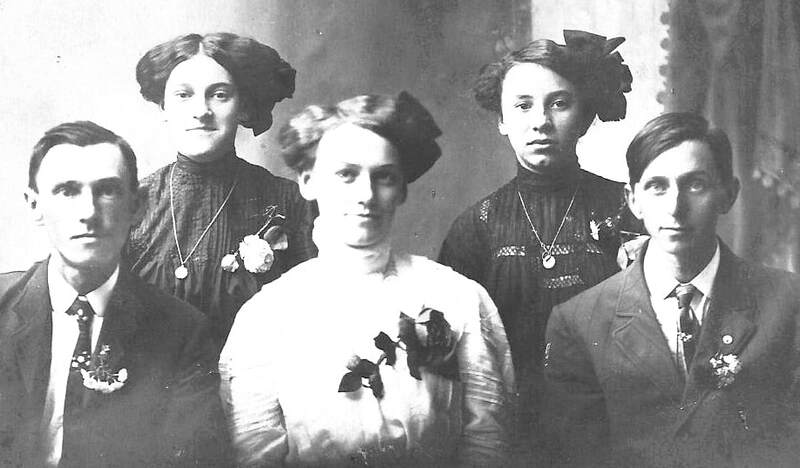 Front row: Ralph Stepan, Rose L. Stepan Hubka, & Rose Mae Stepan Herink . ​Photo 4623. A big house party at the Joe Stepan home near Dubois. 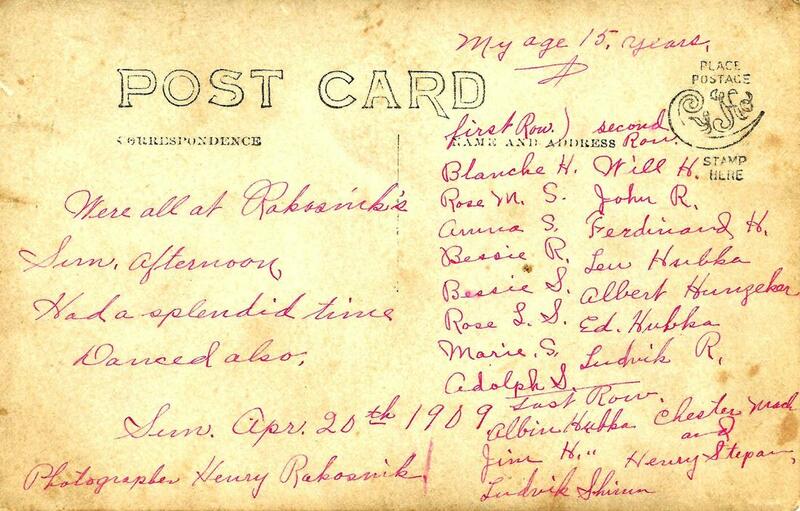 The postcard text says it was a dance party on April 20, 1909. 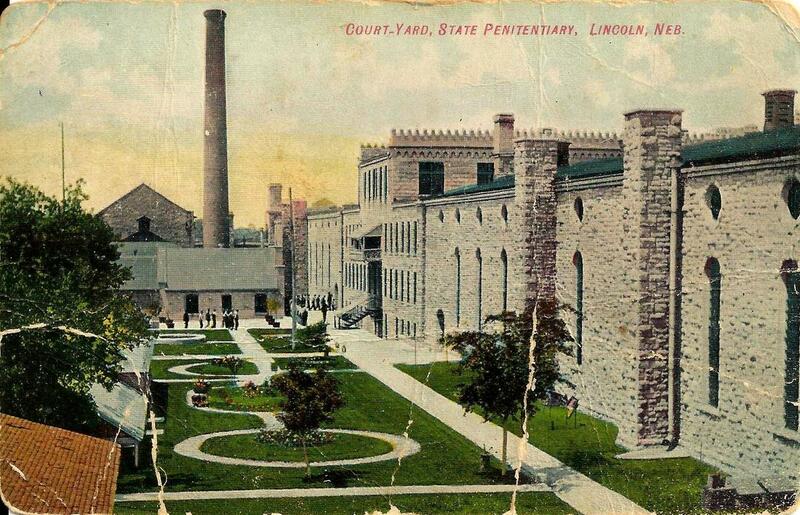 A date stamp says it was in July 1908. I would trust the text. Photo 4628. 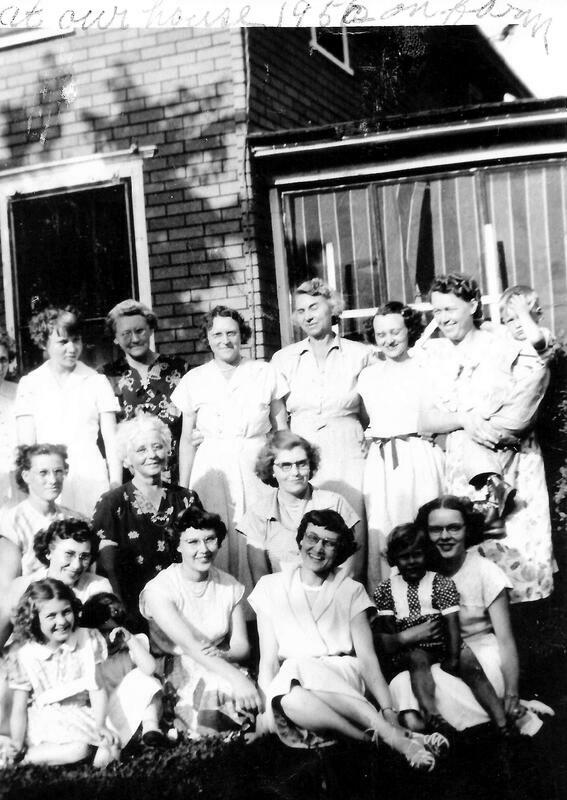 Names according to the back of this picture: First row: Blanche Hubka, Rose M. Stepan, Anna Stepan, Bessie Rakosnik, Bessie Stepan, Rose L. Stepan, Marie Stepan, Adolph Stepan. Second row: Will H., John Rakosnik, Ferdinand H., Lou Hiubka, Albert Hunzeker, Ed Hubka,and Ludvik Rkosnik; Last row: Albin Hubka, Jim Hubka, Ludevik Shinn, Chester Mach, and Henry Stepan. 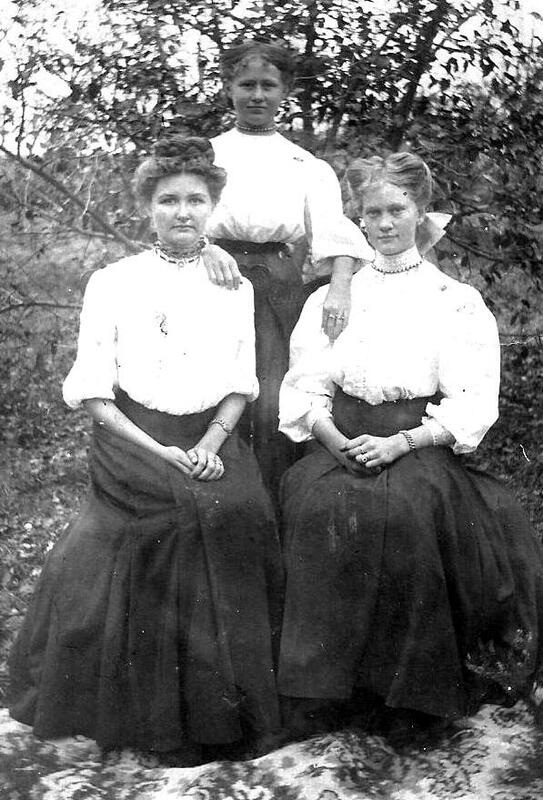 In 1906, Blanche Hubka, Lillian Zulek, Bessie Rakosnik. Photo 4626. 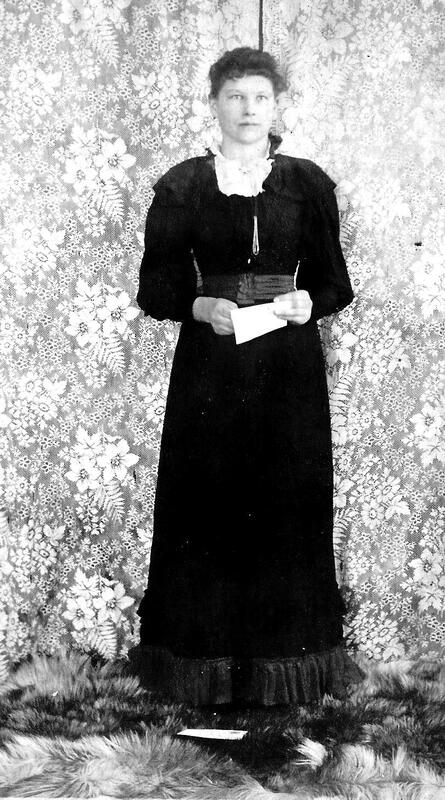 Mollie Kysela, taken in Moore, Oklahoma in 1910. Photo 6490. Millie says that Mollie was not a relative, presumably was a close family friend. A play at Dubois, Photo 6496. 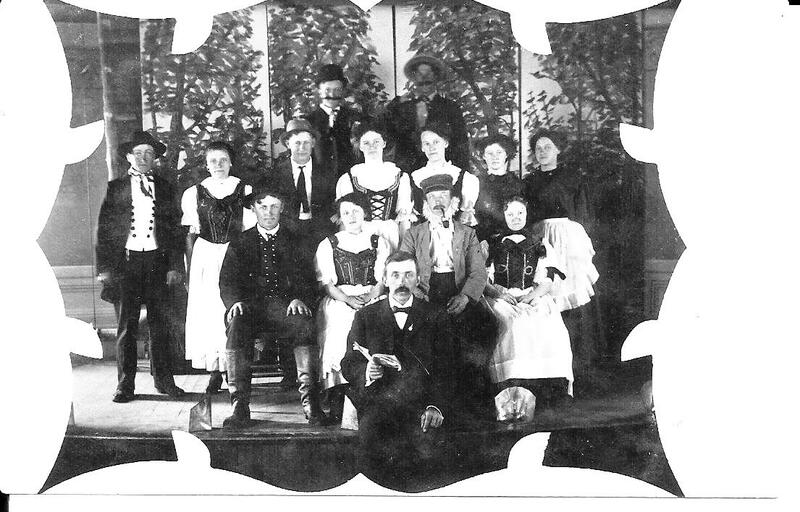 Seated are: Albin Hubka, Rose L. Stepan (cousin) , Frank Mares, Anna S. Slama, Frank Dobrovolny, Manager. 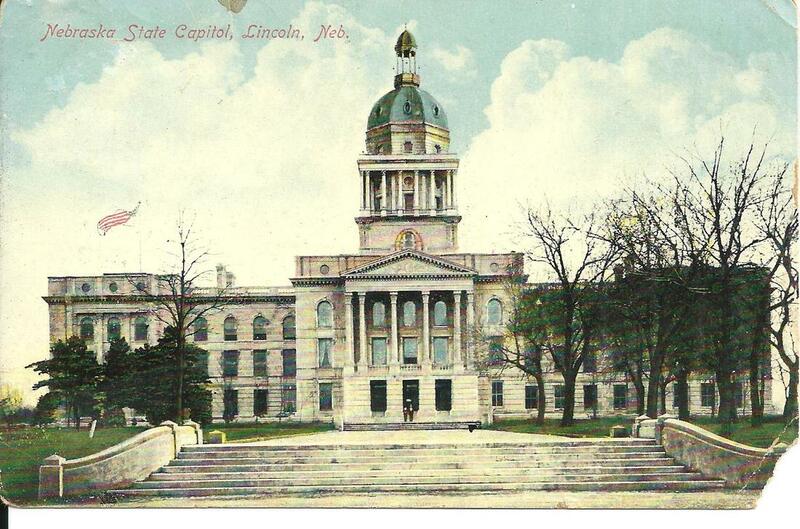 The new Pawnee County Courthouse. Note that in the background to the right is the old Pawnee City Opera House. 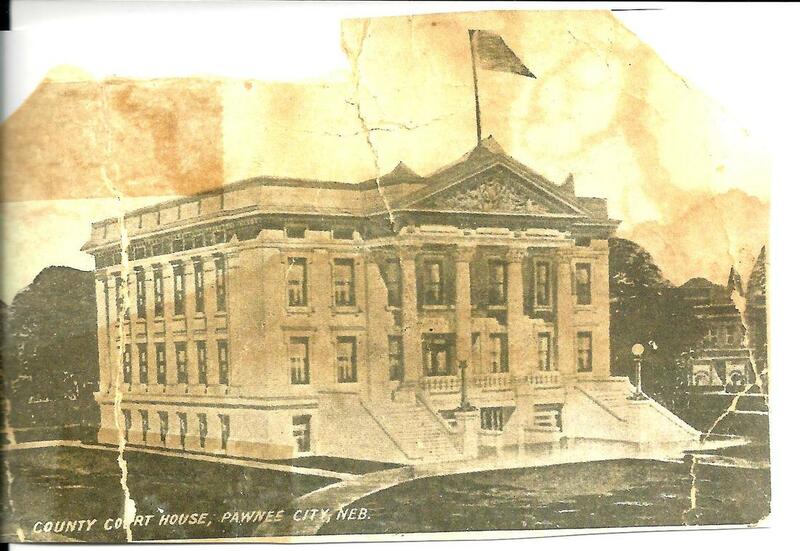 Millie, says about the courthouse, "My parents, Joe and Rose Stepan Herink were the first couple to be married in the new Pawnee Court House , on October 16, 1912. 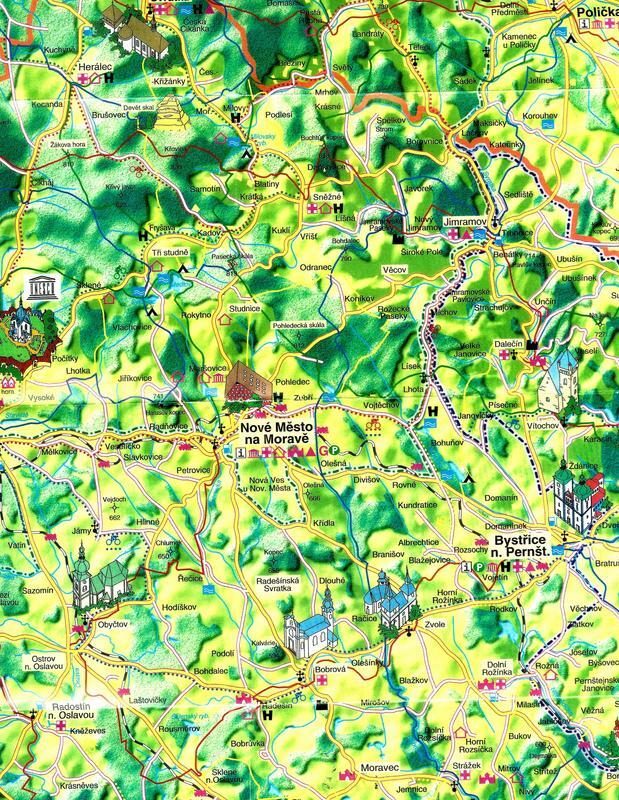 This is a map of Map of Nove Mesto Moravia -The map shows Kuklik and Konikov, villages of Millie's direct Stepan & Vasik ancestors. Photo 4632. Photo 4633, the ship's list for the journey to America of Joseph & Antonie Stepan and family. The ship was only a little over a year old and was to have a long history of its own. Millie does not know this family. She says they were friends of her grandparents Joseph & Antonia Vasik Stepan. 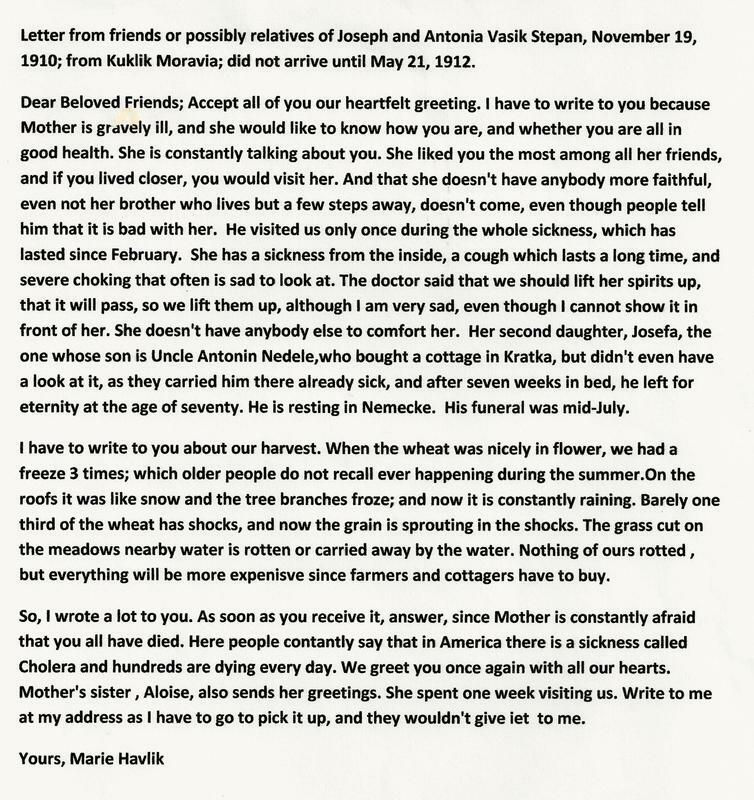 It was written to them by Marie Havlik of Kuklik, Moravia. 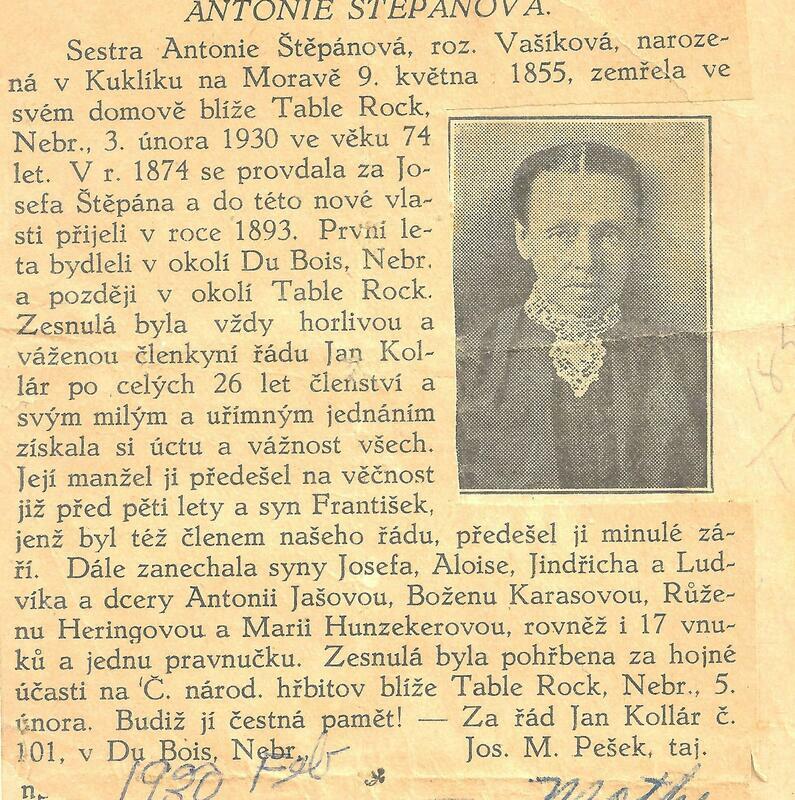 Joe & Antonie had left Moravia in 1893, 17 years before the letter was written. Perhaps letters had been exchanged before. 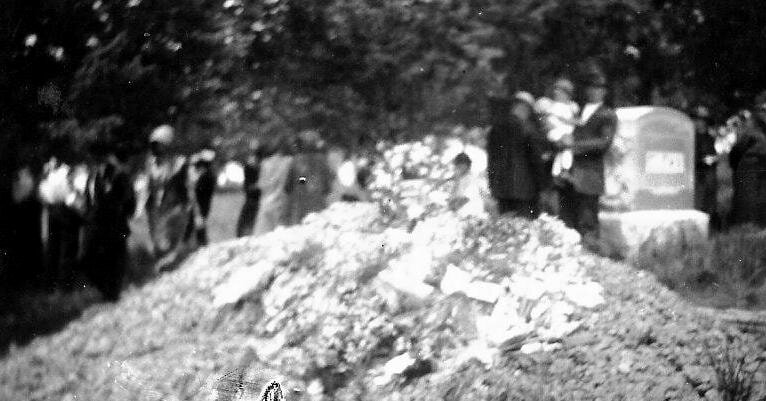 Photo 4636a, apparently the mother Havlik described in the letter, with children. 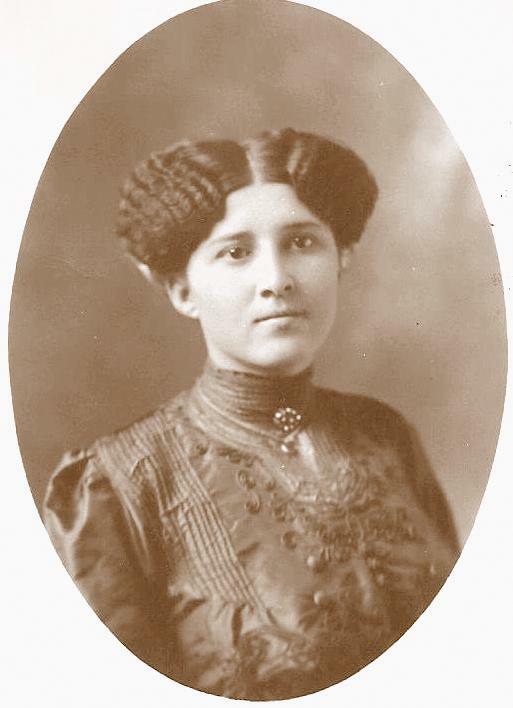 This photograph was included with the letter. 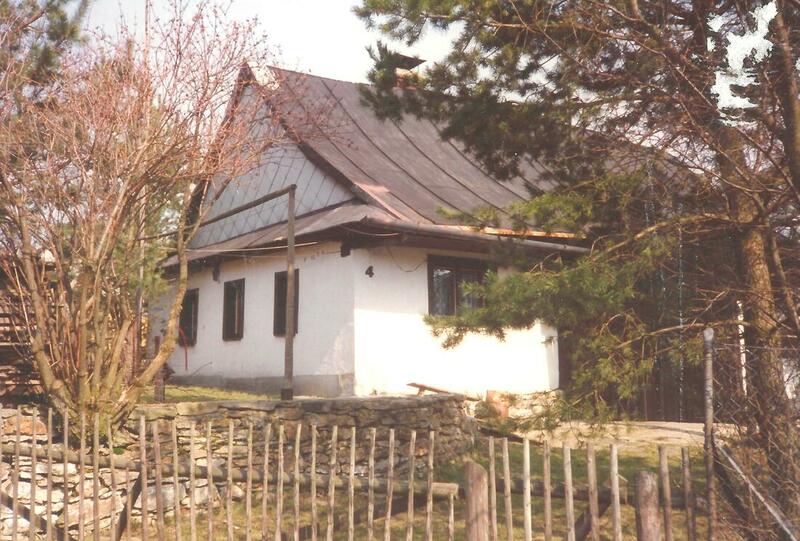 House in Odranec, listed as No. 4, and right on the square near the village chapel and the fishpond. (In the olden days nearly all the villages had a pond in the center). Quaint little storybook cottage. Millie does not recognize the faces and so believes that they must have been friends of the Stepans and/or Herinks. Who are they? 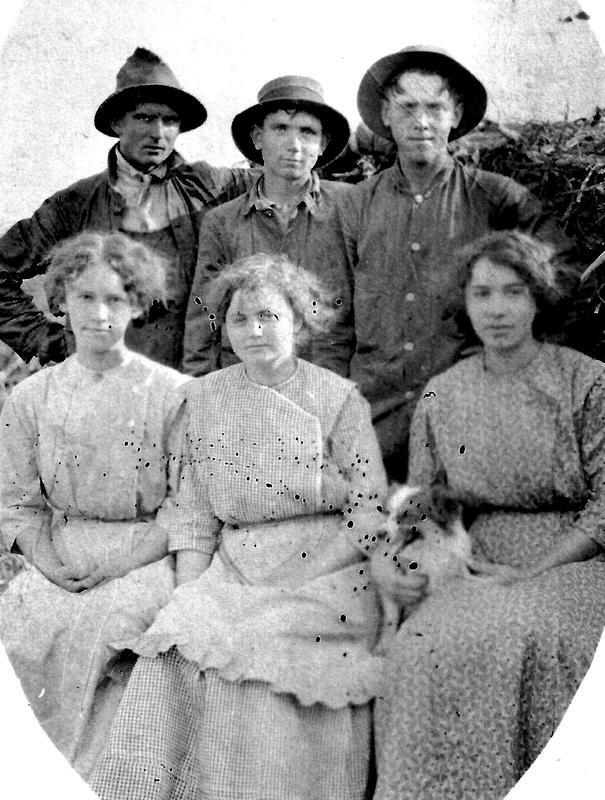 They may be from the Table Rock - Dubois area, but not necessarily. Photo 4662. What a wonderful picture, but who are they! 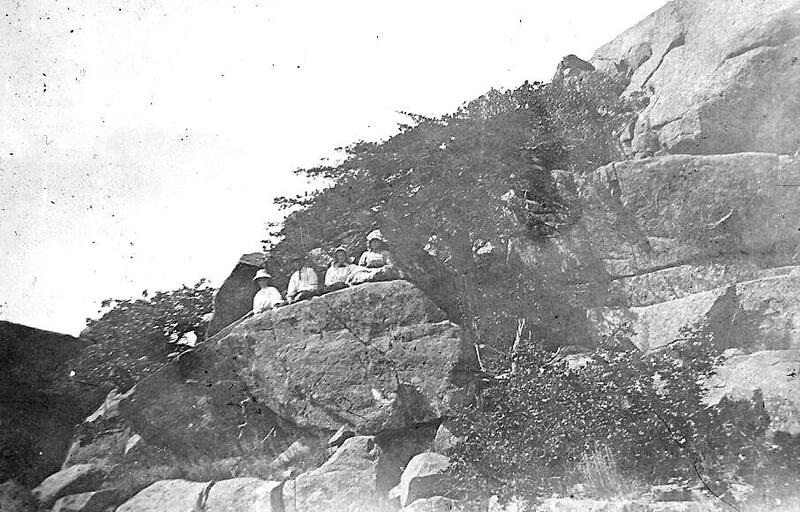 These are in her old family pictures and may not necessarily be Table Rock. 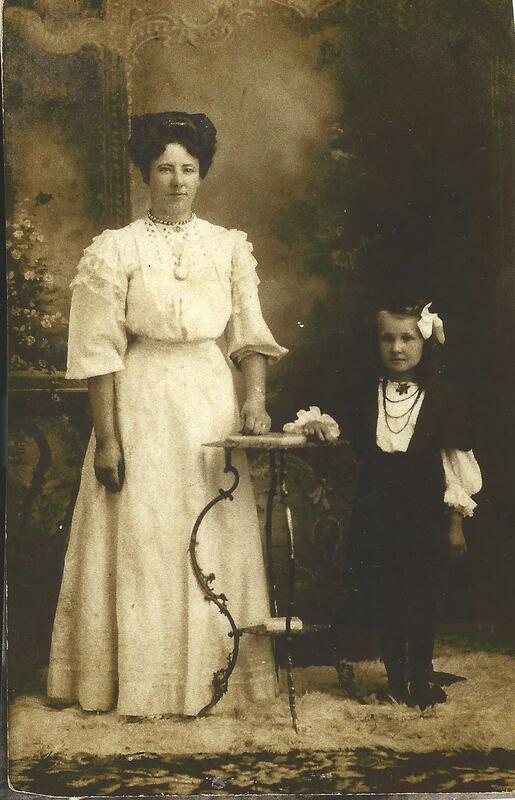 Taken at the E. & H. Photo Company, no place or date. Photo 4611. Photo 4612. Millie says of this one: "I believe them to be Hubka's, but, I can't place them. If you can find somebody in the family they might know them.They look so much like the family...just can't figure out how they fit! Mildred does not know these two young ladies. The studio where it was taken was in Pawnee City. On the bottom of the original is written "Herink," but Mildred thinks that was a reference to who the photo belonged to or was to go to. She does not recognize them. Photo 6470.